National FFA and Discovery Education have joined forces to create a robust, comprehensive career resource to help students explore the broad range of careers within the agriculture industry. 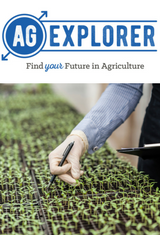 Agriculture has a variety and abundance of careers that fit within nine exciting career focus areas. Students can learn more about which career may be right for them by watching videos, exploring the career profiles and completing the Career Finder interactive.